The first Air Jordan 13 (XIII) Retro Womens Low to release did significantly well, with pairs moving out of the store faster then it took to get their. This model is the Air Jordan 13 (XIII) Retro Womens Low White / Metallic Silver – University Blue – Pink. 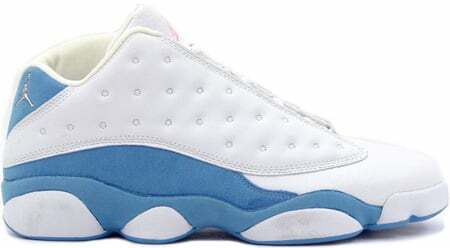 The Air Jordan 13 (XIII) Retro Womens Low White / Metallic Silver – University Blue – Pink contains a White upper, University Blue midsole, and Pink accents. Since this is a low cut Air Jordan 13 (XIII) Low, they featured the silver Jumpman logo on the heel, rather than the hologram.